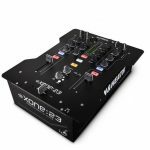 When it comes to just starting out and building your DJ gear toolbox, you’re not going to have the most essential piece of the puzzle without a DJ turntable. 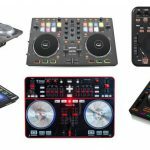 The best beginners DJ turntable in our opinion is going to give you a mixture of the following: affordability, a sturdy build to last a while as a long-term investment, the ability to scratch, and also include some new-age technological advancements to give us a combination of that “classic and old-school” DJ turntable feel while also keeping up to date with certain innovations that have come out the last few decades (think PC compatibility, etc.). We found a main pick to get going but have also provided a few alternatives in case you felt like comparing and contrasting. Let’s first look into what to keep in mind while you shop for your beginner DJ turntable. 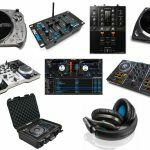 In all cases when shopping for gear, and in particular a beginners DJ equipment setup, let’s talk money. Your budget is definitely a must, and in our opinion our main pick does a pretty good at job balancing our necessary “features and specs” while still providing some affordability (as compared to some other DJ turntables out there that go all the way up to $500+). As always, if you do find a starter turntable you feel is your style and don’t have the cash at hand just yet, we recommend trying to be patient and saving up some more — this will be long-term, and although you can always upgrade later, it’s still a big buy and we feel you’ll have this for at least the next 3-5 years. Do you want to scratch or just spin? DJ turntables are of course famous for that well-known and legendary “scratching” we’ve seen DJ’s perform for the past 3-4 decades. Nowadays with the advancements of technology however with DJ controllers, MIDI and more, scratching is (unfortunately) becoming a bit more “rare”. At least, scratching with a “traditional vinyl record” is, considering DJ software nowadays provides us the ability to scratch using literal MP3’s and not even needing records. 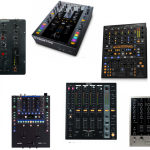 It’ll all depend on which route you want to go — we know some who want to learn how to scratch ASAP, while others just have a turntable handy next to their DJ laptop and other gear for some show as well as versatility. Lastly, what type of DJ setup are you looking to build? Do you want a traditional 2 turntables, DJ mixer and speakers “analog” setup? Perhaps a digital-only with USB connection to your computer mixed and controlled using software? 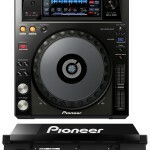 Or maybe a mixture of both to have a nice “hybrid” (which we love the most) DJ setup? This is a tough question and may be one to answer down the road; however, the question of whether you need 1 or 2 turntables at the moment is a big one. We recommend just buying one for now and using some software or a mixer to get going and learning. You can always buy another turntable and add your additional gear once you get the hang of it. You can read our best beginner DJ mixer after this to complete the puzzle. As our number one pick, we’ll dive into the Gemini TT-11000USB, which is a model that we consider the best beginner’s turntable for a number of reasons — a great mixture of affordability, overall turntable capabilities and longevity it will provide for our learning DJ’s. First and foremost, this particular brand is one of our favorites and has been a common household name in the DJ world since the 70’s. We aren’t necessarily “brand favorite” types of gear junkies; however, especially when first beginning our endeavors, brand consciousness can help our confidence when making our first buy, and considering Gemini’s been making turntables and DJ gear for nearly 40 years, it’s safe to say they know what they’re doing at this point. Let’s get into the features. The TT-1100USB is a fully manual belt-driven DJ turntable with an aluminum platter with a battle/club design. These features help us have confidence in the longevity it’ll bring us — just take proper care of it and you’ll be good to go for years to come. It also features a fully adjustable counterweight and anti-skating controls for relatively stable stereo balance, as well as a MOTOR off/on button for slowed braking which helps for smoother braking on your vinyl. For scratching, it’s also amazing while we’re learning with these controls and help with missing out on our records with the needle. 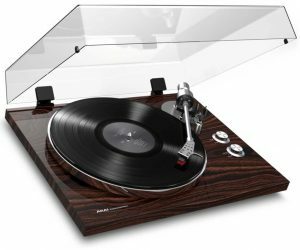 It can handle speeds of 33/45/78rpm with solid reverse playback capability which is really solid for a beginner’s turntable at such a price. On top of it all, let’s look at the technological advantages we’ll be getting with this one. The TT-1100USB can be connected to a USB port on a PC or Mac, allowing users to transfer their vinyl collections into digital formats at a 44.1 kHz sampling rate and 16-bit depth. The sound resolution here is key, and is up there with some of the best to ensure we aren’t going to get that low-fi sound (unless that’s what you want, just adjust while you transfer). The USB compatibility will also help us plug-in to a hybrid or all-digital setup, being able to combine our gear we buy further down the road, such as controllers, MIDI gear, and more all hooked up to our software or DJ apps. 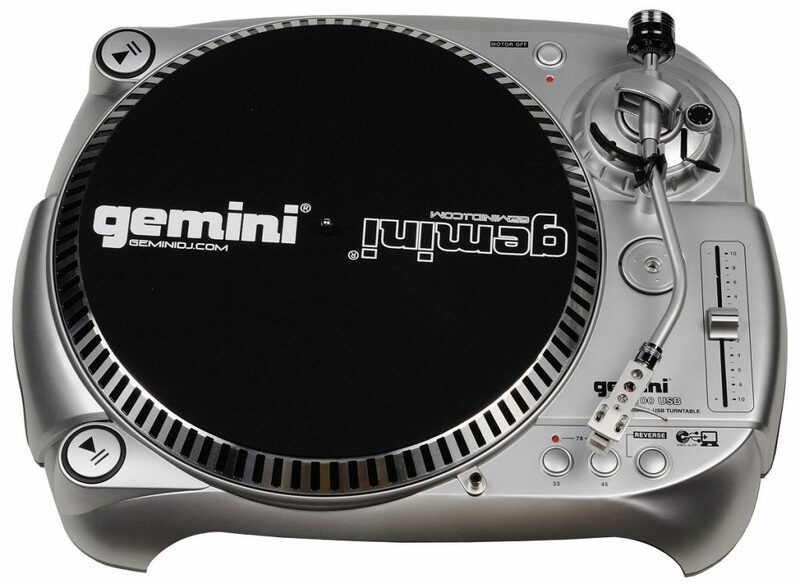 All in all, If you’re looking for some good value and turntables that will just flat-out get the job done, the Gemini TT-1100USB is the best beginner’s option for you. We love this one since it covers the bases we provided prior to the pick — lower price-tag, technologically savvy, great for learning how to scratch, and super reliable to act as a long-term investment. As our first alternative to the number one pick, here we have the Numark TTUSB. This one is a simple plug-n-play USB turntable that works well on both Mac and PC platforms. The TTUSB also has the capability to blend your vinyl records into a digital collection and simple USB connectivity, which are a couple of the reasons why it’s known to be one of the best starter turntables. It also has some great beginner staple-points, with features like an adjustable anti-skating control that allows for stronger stereo balance while mixing. The TTUSB supports playback speeds of 33.33, and 45rpm, has a +/-10% adjustable pitch control, and a 1/8” stereo input connector that will help the transfer of cassette tapes into computer files – making this an ideal tool if you’re archiving old recordings. 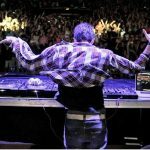 Converting files is easy – simply exporting your analog music to popular digital formats like WAV or MP3 will allow you to put your old records onto the top of your music library, allowing us to organize and combine both vinyl as well as digital MP3 or playlists we use on streaming services all together. The Numark TTUSB and previous Gemini pick are rather comparable as they are both USB-powered and similarly priced, while also both blending the vinyl and digital worlds – choose whichever best fits your style or is priced lower at the moment. You can scratch on both, too! Now we’ll take a look at the Audio-Technica AT-LP120BK-USB, which is a pretty cool model that is one of the best turntables for beginners who want a manual model. Like the previous two turntables discussed, the AT-LP120BK can also convert your vinyl records to digital audio files. 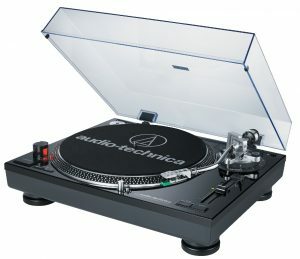 The Audio-Technica also features a manual, 3-speed cast aluminum platter with slip mat to scratch and a start/stop button while offering forward and reverse play capability; it has 3 speeds 33/45/78. This model also has selectable ‘high-accuracy’ quartz controlled pitch lock and pitch change control with +/-10% or +/-20% adjustment ranges for solid pitch variation. The switchable internal stereo phono pre-amplifier comes with RCA output cables which allow the turntable to plug directly to components with no turntable-specific input. You can use this specifically for that “traditional” analog setup we previously spoke of, or with the USB compatibility, plug it in to your computer to get going digitally — one of the reasons we love this as the best beginner’s DJ turntable due to its versatility. The Audio-Technica AT-LP120BK-USB includes a USB cable with Mac and PC-compatible ‘Audacity’ software to digitize your LPs. The Akai Professional BT500 will be one of the best beginner turntables if you need to stream your music wirelessly. Here we have a different spin to what a “DJ turntable” may be assumed to be — hence including it here near the bottom in case you weren’t interested in our previous three picks. The BT500 is a belt-drive turntable with a mechanically isolated motor that drives the die-cast platter with speeds of up to 33 1/3 and 45 RPM. The Akai is pretty high-end – you can tell by just looking at the classic walnut finish and aluminum controls that it’s made for audiophiles. Cueing is rather easy with the turntable, as it comes with a rubber non-slip mat and low mass-straight tonearm with adjustable counterweight. It also has a built-in phono preamp for your convenience – you can plug it into your traditional stereo, or even connect it directly to your powered speakers. The look of this turntable is just beautiful. It hopped onto the wireless movement not too long ago, as it is able to wirelessly stream any of your vinyl records via Bluetooth. The Akai BT500 can also convert your analog records into digital files using the included software – grab this turntable if you’re a wireless type-of-DJ or more of a leisure listening type of person. We wouldn’t recommend it for learning how to scratch like our previous picks. Lastly, we have the Roland TT-99, which is a direct-drive turntable that combines affordability and reliability with the old-school, retro-style look. The Roland has a brushless DC motor that delivers a steady 1kgf/cm2 torque for 1 second or less start time – so you could say the motor is a little bit above average. It also has an electronic brake to ensure a 1 second or less stopping time which is important when you’re trying to stop a track on a dime (more geared towards live performance DJ’s who don’t use playlists). The TT-99’s S-shaped tone arm is stable yet relatively easy on the vinyl, and with its 3 playback speeds (33/45/78 rpm) and +/-10% pitch-adjuster, it’s pretty simple to get the playback you need. 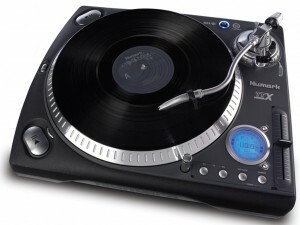 Not to mention this is one of our favorite beginner DJ turntables to learn scratching on. The Roland also has a built-in EQ phono so you can get the most optimal sound out of your tracks. 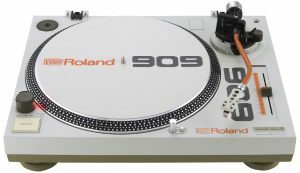 If you’re looking for a vintage style turntable with a 909 slip mat, the Roland TT-99 may just be the best starter turntable for you if you wanted a mixture of reliability and the ability to scratch. However, it’s listed last since it’s a bit pricey as compared to the others, but if you can afford it — this is amazing.